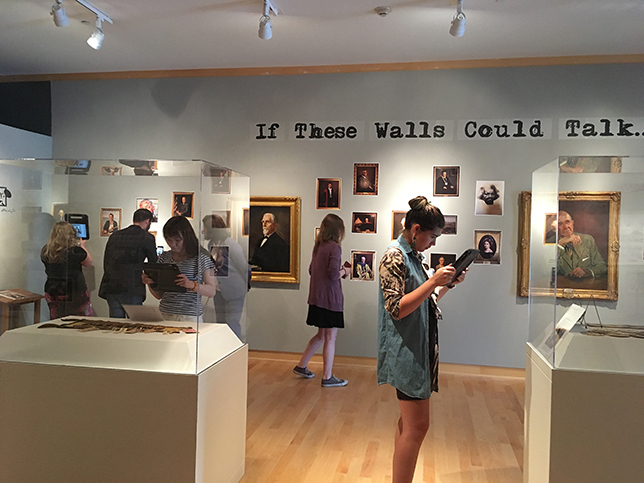 At Washington College, students become curators, using augmented reality to create museum exhibits of materials that otherwise require restricted physical access. One of the biggest challenges for an archivist is to find ways of making the rare, fragile and valuable materials in special collections more accessible to researchers and library patrons — not just stuffed away in boxes for preservation. At Washington College (MD), a collaboration that brings together faculty and staff from Archives and Special Collections with Academic Technology staff is addressing this issue by engaging students in "investigative curation" — all through the college's Augmented Archives initiative. Students work hands-on with delicate artifacts and design new ways to interact with the materials via an augmented reality interface. In several Augmented Archives programs, students use augmented reality (AR) to create museum exhibits of the college's most precious and historic archival materials — utilizing the technology to encourage high levels of patron interaction with primary source materials that otherwise require restricted physical access. The AR exhibits are created for the public and the many types of users who may be interested in interacting with these materials digitally. 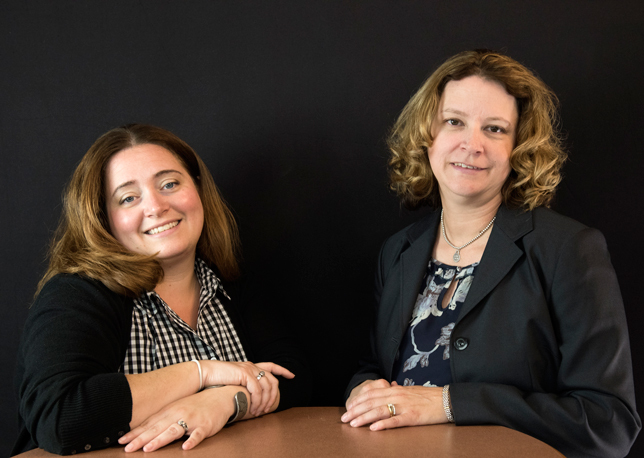 Archivists and instructional technologists work with students in different contexts, and at different points in the progress through their academic careers at Washington College, to move the overall initiative forward. 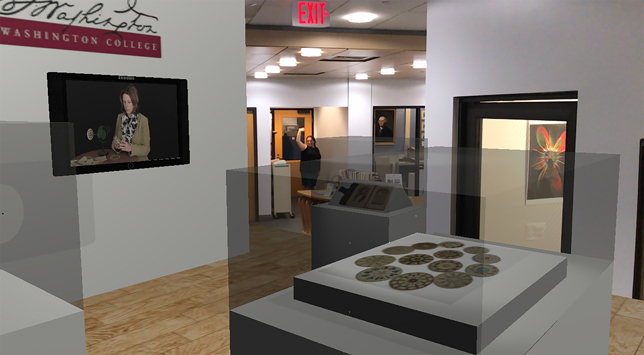 An Augmented Archives Sandbox showcased AR-enhanced student exhibits in the campus art gallery. Among the programs engaging students as curators is "Washington's Secret History," a pre-orientation activity for incoming freshmen that helps students get to know the college and surrounding community by creating AR content for a local museum. 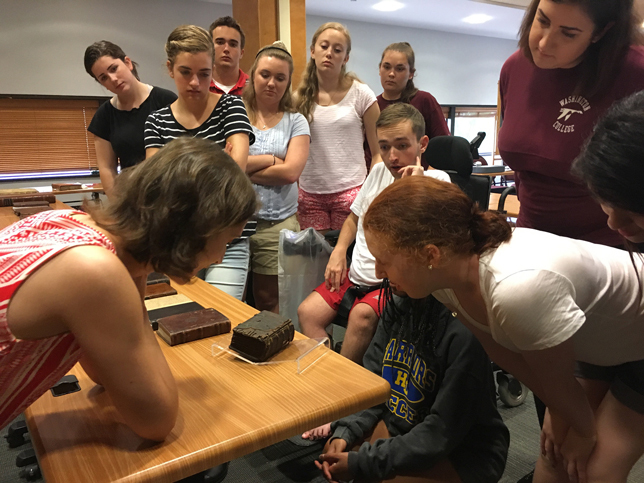 Students also encounter Augmented Archives during the year, in programs or courses with titles such as "Voices from the Grave" and "The Talking Portraits of Washington College," culminating in a Sandbox exhibit showcasing the results of student work. The most recent Augmented Archives project under development is a Pocket Museum app, which allows a viewer to experience a virtual exhibit walking through a virtual gallery. Students work hands-on with original archival materials, digitizing them, analyzing their content, and designing new ways for others to access the materials through an AR interface. Using HP Reveal (previously known as Aurasma) for AR authoring, students create trigger images for users to begin to explore the artifacts digitally and discover supporting material and relevant links. The students have produced museum-quality exhibits that incorporate scanned images by using CamScanner; photographs and videos by using tools like Apple iMovie, YouTube and ProCyc MyStudio; and animations by using tools such as Blabberize. Cloud storage and collaboration options are available through Microsoft Office 365. The college loans students iPads and laptops for the work — common tools that were found to be more than adequate to accomplish most of the tasks needed to create the AR exhibits. 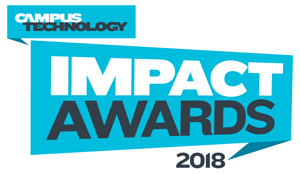 Technologies like augmented reality, virtual reality, and multimedia and visualization tools have been proven at many other institutions for their value as a supplement to, or replacement for, physical access to certain materials. But Washington College's unique insight, beyond that, is to offer students a role in the curation of archival materials, using AR — the Augmented Archives programs have established a process that includes students as true participants in the scholarship of these assets. "One of the things we wanted students to come away with is that scholarship isn't just for academics," explained project co-lead Raven Bishop. "Students involved in investigative curation will be asking relevant research questions and sharing their findings and scholarship with the wider world." Co-lead Heather Calloway reflected on the growth of the Augmented Archives initiative over time: "Every term now, we are digitizing more and more of our assets. This is opening up new possibilities for us in the long run, in terms of greater access to our collection." AR technology helps provide an authentic experience of scholarship for students and researchers alike. Real-world outcomes are paramount in the college's Augmented Archives strategy. The team's hope is that archival materials curated with AR technology will get much further exposure to ongoing scholarship and as well as becoming a lively part of the campus culture at Washington College.